This program is a compiler to parse formal metadata, checking the syntax against the FGDC Content Standard for Digital Geospatial Metadata and generating output suitable for viewing with a web browser or text editor. It runs on Linux and UNIX systems and on PC's running all versions of Microsoft Windows (95 and up including XP). 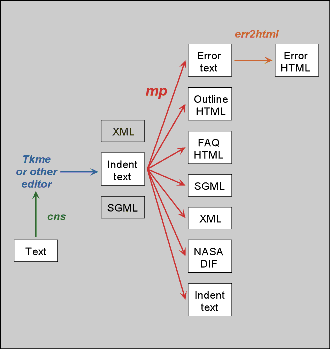 MP generates a textual report indicating errors in the metadata, primarily in the structure but also in the values of some of the scalar elements (that is, those whose values are restricted by the standard). A separate document shows the revision history of mp (that page is generated automatically by extracting the information from Process_Step elements found in mp's metadata). Note that these symbols cfile, ffile and so forth represent the full names of files appropriate for your operating system, and may include directory path separators (on Windows this is the backslash \ and on Unix the slash /). Syntax error messages indicate the nature of discrepancies between the input file and the standard, and the line numbers of the relevant elements in the input file. If -e efile is not specified, syntax errors are written to stderr, which is usually the console (for MS-DOS) or the terminal from which the compiler is launched. Since the FGDC Content Standard for Digital Geospatial Metadata, as the name implies, specifies only the contents of metadata files and not their encoding, it was necessary to devise a specification for metadata encoding in order to develop and use this compiler. That encoding format is purely textual and the fidelity of the compiler to this format is fanatical. The FGDC metadata standard was written before XML existed. At that time, SGML did exist but its use was not common outside some specific communities such as the publishing community (remember Ventura Publisher?). Since then, XML has become more widely accepted and supported, and mp was modified to read well-formed XML documents that use specified element names arranged in accord with the Document Type Definition. Note: mp does not read word-processor documents, it only reads plain text, SGML, and XML! Aside from the error report, output is generated only in the formats you specifically request (meaning that no other output is generated by default). Use the command-line options to specify the output file names and formats that you want. In these examples, the name of the input file is catfish.met. A report of errors is written to the file catfish.err. In addition to the error report, an outline-style HTML page is created, named catfish.html. In addition to the error report and outline-style HTML page, a FAQ-style HTML page is created, named catfish.faq.html. Because the command line can become long and complex, you can simplify the process by using a configuration file. Text output, if requested, follows the encoding format. This provides a check of the compiler; any such program should be able to reproduce its input without significant loss of information. HTML output, if requested, uses descriptive lists to arrange the elements hierarchically. The HEAD element of the metadata contains META elements corresponding to the Dublin Core. the FAQ-style output that mp generated for it. Dublin core elements are added to the HEAD element as META tags. Obviously you have to use the -c config_file command line option for mp, substituting for config_file the name of the actual config file you'll be using. SGML output uses the eight-character tags proposed by the FGDC Clearinghouse Working Group. The SGML output is designed to work with a SGML Document Type Definition (DTD) that I have developed and tested. XML output uses the eight-character tags given in the 1998 version of the CSDGM. The XML output is designed to work with a XML Document Type Definition (DTD) that I have developed and tested. NOTE: the DTD won't be displayed in the main browser window because it consists of DTD entries, all of which begin with < and end with >. The web browser thinks these are some weird kind of HTML tag, so it ignores all of them, leaving you with nothing. To see the DTD, choose Page Source from the View menu of the browser. Or if you choose Save As from the File menu, you can open the DTD in a text editor. Directory Interchange Format (DIF) output will require editing to fix inconsistencies between the DIF and FGDC metadata standards, and to add information required by DIF that is not clearly identified in the FGDC scheme, such as Entry_ID. Translations should be regarded as a work in progress. I seek help with them, especially with languages that are not currently implemented and with new profiles and extensions. A separate table shows the current translation of element names in the various languages supported. Feel free to discuss with me any ways you would like to help with this effort.